Genetic screen identifies mutations that impact green foxtail panicle formation. Through deep sequencing of the model grass green foxtail (Setaria viridis), researchers pinpointed a gene critical for the development of flowers that give rise to the grain. Using this information, a homologous gene in maize was identified as playing a similar role highlighting the utility of S. viridis as a model crop. Maize, an important food and bioenergy crop, has been limited in the progress of gene discovery due to its large and complex genome. Recently, S. viridis has been proposed as a model crop for maize, but the grass is already a model system for the candidate bioenergy feedstocks switchgrass and Miscanthus. In a new study, researchers screening for mutants of the model grass green foxtail identified several mutations that disrupt the regular pattern of panicle development. The panicle is the spear-shaped flowering cluster at the tip of each branch necessary for reproduction. Setaria species, among them green foxtail (S. viridis) and foxtail millet (S. italica), are related to several candidate bioenergy grasses including switchgrass and Miscanthus and serve as grass model systems to study grasses that photosynthetically fix carbon from CO2 through a water-conserving (C4) pathway. The genomes of both green foxtail and foxtail millet have been sequenced and annotated through the DOE JGI’s Community Science Program. 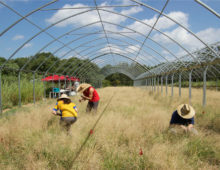 A team led by Tom Brutnell at the Donald Danforth Plant Science Center and including researchers at the U.S. Department of Energy Joint Genome Institute (DOE JGI), a DOE Office of Science User Facility, reported in Nature Plants, that they had identified genes that may play a role in flower development on the panicle of green foxtail. The team identified four recessive mutants, tagged spp1 through spp4, that lead to panicles with reduced and uneven flower clusters. Focusing on the spp1 mutation, they performed deep sequencing to specifically locate the genes that cause the mutation, narrowing their search down to a 1-million base sequence. They ultimately identified the SvAUX1 gene in green foxtail as one critical for flower cluster development in green foxtail. Panicle development is critical for determining grain yield that is crucial to food crops as well as candidate crops for producing renewable and sustainable fuels. A homologous gene in maize was identified as playing a similar role, illustrating the value of model systems in finding genes involved in important properties in potential bioenergy-relevant plants. This work was conducted by the U.S. Department of Energy’s (DOE) Joint Genome Institute, a DOE Office of Science user facility (contract number DE-AC02-05CH11231). This work was also supported by a Department of Energy grant to T. Brutnell (DE-SC0008769), and a National Science Foundation grant to E.A. Kellogg (IOS-1413824).